Whatever unique customs and traditions have grown up around the way Christians celebrate Christmas there is one aspect of Christmas that is the same wherever you go. Around the world the Christmas story is at the heart of Christmas worship. The same story is celebrated around the world today in cathedrals, small country churches, under gum trees, or in home churches hiding from authorities. It’s a story, a true story about God and what he has done for all of us. The Bible tells us that when the time was right, God sent his Son from heaven to earth and the way he did this was quite extraordinary. God's Son didn’t come riding on the clouds or in a flash of lightning or a puff of smoke. There was no grand entrance. God came into our world in the same way as you and I but with more extreme conditions. He was born in Bethlehem in a stable. His first bed was an animal feeding trough. His parents were poor folk from Nazareth. His first visitors were lowly and humble shepherds on the one hand, and the rich and well-educated wisemen from East on the other. This baby had come for all people. We heard in the readings that this baby in the manger is God and that he reflects the brightness of God's glory and is the creator and sustainer of the universe. We are told that this baby brought God's light into our dark world. There's no doubt that this is true but at that moment in the stable when the first cries of a newborn boy were heard, this baby to all intent and purposes was just another Jewish baby born to impoverished parents. To anyone else who happened to look into the stable that night that’s what they would have seen. The father, an ordinary man, looking on and the mother holding a beautiful new born and they would have ooed and aaed as people do over new babies. But if Christmas is just about telling the story of the birth of baby born in strange and difficult circumstances then we have missed the whole point completely. If Christmas is just about singing nice songs about a baby and angels and shepherds and wisemen then the whole season has become meaningless. If Christmas has just become traditions and customs, gifts and food, family and fun then we have truly lost the plot. All around the world today these words are being spoken again just as they were that very first time in fields near Bethlehem to shepherds as they watched over their sheep. For over 2,000 years those words have reverberated around the world telling all who care to listen that here is some exceedingly joyful news. God has sent you a Saviour – Christ the Lord. The Old Testament reading (Isaiah 52:9-10) tells us, “Break into shouts of joy” because God is saving his people. 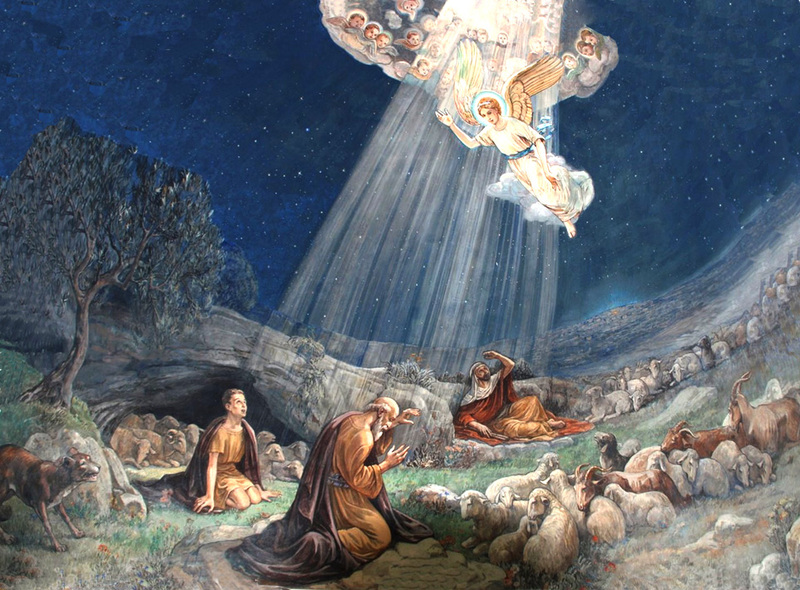 The angels praised God saying, “Glory to God in the highest heaven!” The shepherds praised God singing loudly as they returned to their sheep and the hearts of the wisemen were filled with reverence and joy as they made their way home. We know of the reaction of those people at the first Christmas to the baby in the stable. What is your reaction to the news, “This very day in David's town your Saviour was born—Christ the Lord”? That might seem to be a dumb question but I don’t want to take for granted that you have heard the angel’s message and responded as the shepherd’s did. They believed and worshipped at the manger of the Saviour – Christ the Lord. The angel is speaking to you today. Sure, you’ve heard the Christmas story a thousand times. As children you’ve probably dressed up and been shepherds or wisemen or angels and said those words. You have come to countless Christmas services and heard preachers talk about the meaning of Christmas and so it can all become just a bit ho-hum. And that’s just it. We miss the point of the Christmas celebration because we’re so familiar with it. We sing the Christmas carols because that’s what you do at Christmas and the words mean nothing. We sing ‘O come, all ye faithful’ every year. We sang it a while ago. We can easily sing these words as just another nice Christmas carol without giving a thought to the words just as we can listen to the Christmas story and the words of the angels and let them pass right over our heads. In fact, they reflect very well the readings for today that state that Jesus is true God who became a human being and lived among us (John 1:14). He is the real light – “the light that comes into the world and shines on all people” (John 1:9). Christmas is not just celebrating something that happened in the past. If that’s all we are doing then forget it! It’s celebrating what God is doing in our lives right now. What the angel said to the shepherds, he also says to us today, “The child born in the stable at Bethlehem is our Saviour now”. He is the one sent by God to save us, to rescue us from our sinfulness and from death, and to bring reconciliation between God and all people today. Christmas calls us to open our eyes to the present and the workings of God's promises in our lives today. We are called to reflect on what Jesus means to us now and to rethink and recommit ourselves to following him more closely. God's promise of peace and joy to the shepherds back then is just as much for all of us and the world today. God's promises made 2,000 years ago through the baby in the manger are for all of us today. Christmas Day is a call to open our hearts to the One who is God’s gift to us all.